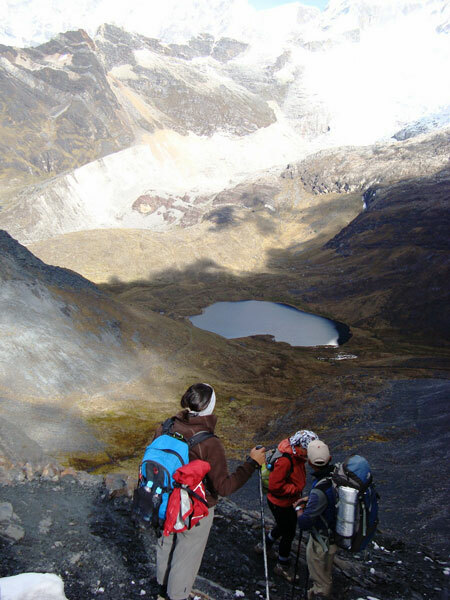 An extension and more challenging alternative to the traditional Llanganuco Santa Cruz Trek. From the Quebrada Huaripampa where the Classic Santa Cruz trek finishes we continue on for two more days to a high mountain plateau campsite at Avalanche Place, then cross a second spectacular pass Paso Punta Yanayacu (4850m) and finish our trek in the beautiful Quebrada Ulta hiking close to Huascaran – the highest mountain in the Cordillera Blanca. A tremendous shorter trek with great variety, and an excellent warm up for a climbing trip. Louise from the UK/ Santa Cruz Ulta Trek said: Thanks very much for making our time in Peru very special. I will have some very special memories to take back with me. Peru is amazing! – I will DEFINITELY be recommending you to my friends. PS- extra thanks for the pizza and the cake! Day 1: Drive from Huaraz to Cashapampa 2800m 3 hours. We meet our donkey drivers, load all equipment onto donkeys and start trekking. We hike continuously upwards following the Santa Cruz river, first we are in a narrow canyon and then after lunch the country opens up into a wider valley and we start to see the snow covered peaks. 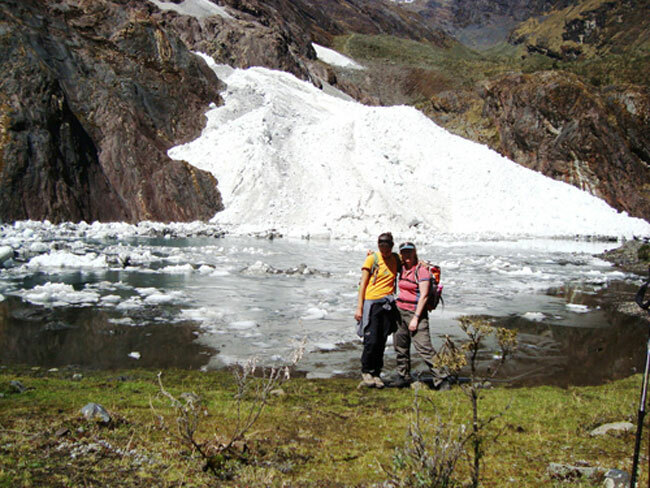 We camp in an open field near the river at Llamacorral 3750m 5 hours. Optional extra day. Stay another night at beautiful Taullipampa campsite. Options to visit Alpamayo Base Camp, Lake Arhuaycocha, climb Centillo Peak 5000m or have a rest day. Day 4 (or 5): At first we walk easily down the Huaripampa Valley passing through farming settlements and villages to Colcabamba where we meet a lot of local people and especially children who come running to greet us. . We then climb gently to camp by a stream at Molino Pampa in the Quebrada Keshu 3600m. 6 to 7 hours. 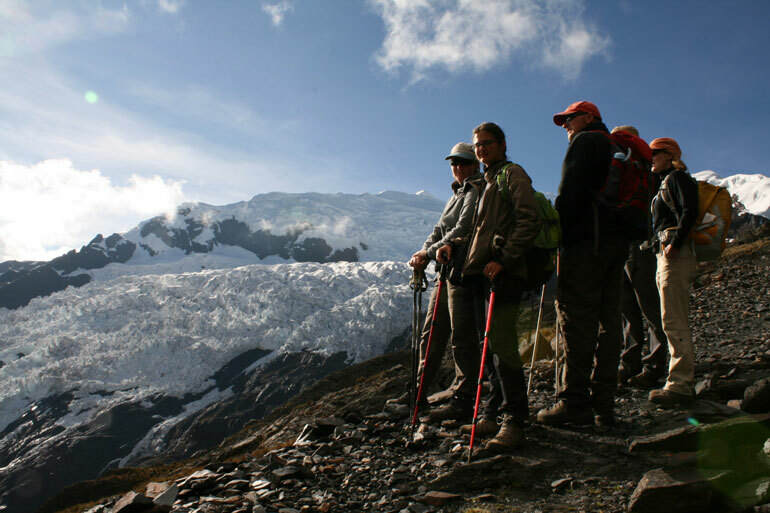 Day 6 (or 7): A climb of around 2 hours to the high and narrow pass of Punta Yanayacu (4850m) where we have close views of the glaciers on Nevado Contrahierbas and the massive peaks of Chopicalqui and Huascarán. 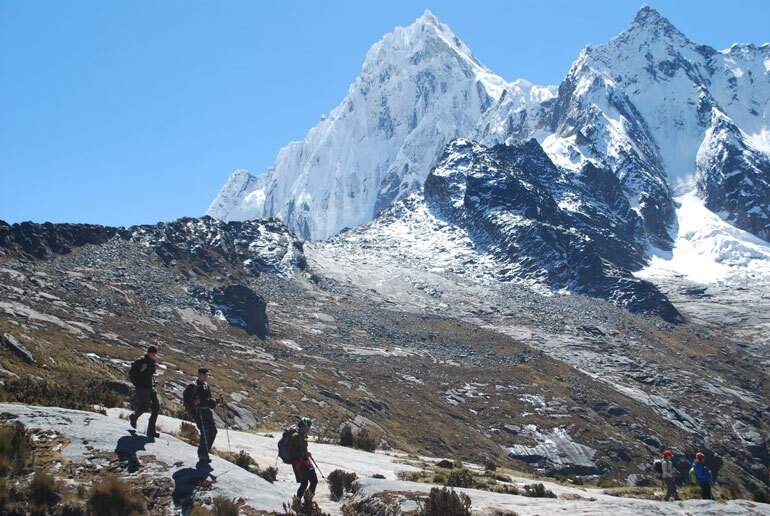 Then descend to Quebrada Ulta where our private van will be waiting to return us to Huaraz.